China’s biggest lender Industrial and Commercial Bank of China (ICBC) said Saturday that its Middle Eastern (Dubai) branch achieved in 2012 a pre-tax profit of $54 million, up 69 per cent year on year, while its total assets increased 29 per cent to $4 billion. ICBC, the world’s biggest bank in terms of market capital, added that the Chinese renminbi (RMB) currency trade volume reached $2.25 billion, while US dollar transactions in the interbank money market were up 718 per cent last year to hit $11.07 billion. The total liabilities reached $3.81 billion, an increase of 28 per cent over 2011. 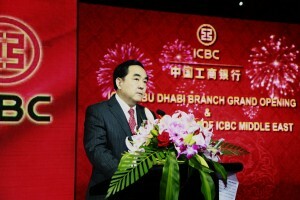 Tian Zhiping, regional CEO of Dubai-based ICBC Middle East, said that 2012 was another year of strong growth for them the company continued to benefit from its regional franchise and unique position as a bridge for trade and investment between the Middle East and China. ICBC said its subsidiary in Dubai, as well as branches in Abu Dhabi and Doha of Qatar, contributed to the strategic expansion of the bank’s Middle Eastern business. ICBC also provides project financing to the increasing number of Chinese businesses operating in the Middle East. In the United Arab Emirates alone over 3,000 Chinese businesses run branches. Global consultancy McKinsey and Company predicts that bilateral trade between China and the Middle East will reach between $350 and $500 billion by 2020, with the Gulf Arab states, most of them major oil suppliers, accounting for the lion’s share of the trade. As one of its latest achievements, ICBC signed a memorandum of understanding with Qatar Holding, the sovereign wealth fund of Qatar’s ruling family Althani, to boost bilateral cooperation and investments between Qatar and China. Qatar has won the bid to host the FIFA World Championships in 2022 and will invest by 2015 some $120 billion to upgrade the country’s infrastructure. In addition, the chief executive said ICBC hopes the Kuwait and Riyadh branches join the lender’s Gulf Arab network within this year.